When slot machines first started to appear in casinos it was a very rare sight to see a game with more than one pay line. Walk into any casino today and you will see how much slot machine gaming has changed over the years. It was not until the 1960's when slot manufacturers took a shot at making games with more than one line on a big scale. While five line games were not an instant hit their popularity grew over time. Today all of the major manufacturers make games with a very wide range of line variations Some of the most popular multi-line games are still the three reel five line slots. There are in fact two types of five line games. These are the three spinning reel varieties and the five reel varieties. Obviously there are some big differences between the two even though they both share the same amount of pay lines. 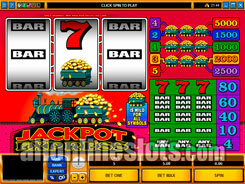 Both types can be widely found in casinos in the United States, around the world and online. The images below show you one of each variety. The Jackpot Express game on the left is a three reel, five line game while the Gopher Gold game on the right is a five reel, five line game. If you want more details on the two games simply click the images to be taken to their review pages. There are some differences when comparing the two varieties outlined above. The main one is the way the pays work. On the three reel games you will usually have five different top jackpots depending on which line you hit the winning combination. On the five reel version it is usually the same jackpot no matter what line you hit the winner on. One thing that you will notice if you go from a single line game to a 5 line game is that the hit rate tends to be higher. This is simply because there are more ways to win on each spin. Of course with this higher hit rate comes a higher max bet so it pretty much evens out. 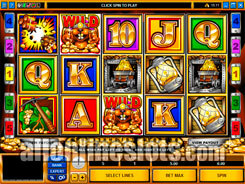 Here at All Online Slots we have reviewed all of the 5 line games online. Select a section below, read the full reviews and find out which online casinos have the game. You can then try out the games for free or have a spin for real money with the chance to win real money.